Carrots are the most popular root vegetable grown in the home garden. And for good reason. They taste great, are super nutritious, and are fun to pull up. Growing carrots, isn’t all fun and games, though. They’re particular when it comes to soil and can be stubborn when it comes to germinating. 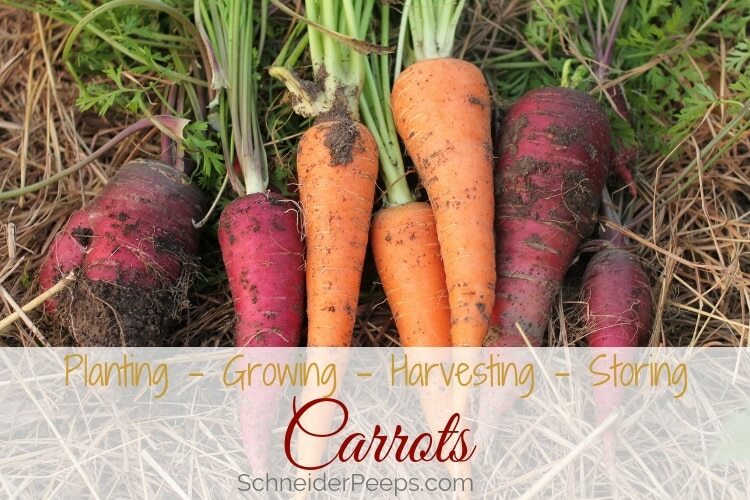 Let’s chat about how to plant, grow, harvest, and use carrots so you can successfully grow these nutritional powerhouses in your vegetable garden. I can never plant enough carrots to last us all year, but I keep trying, and use these worksheets to figure out how much to plant. You can get a copy of these worksheets emailed to you by filling out the form below. Carrots are cold hardy in zones 4-10. The tops can withstand temperatures to 18°F and the roots can withstand even lower temperatures. Carrots prefer cooler weather so while they can be grown all summer long in mild summer climates, they’re in a fall/winter crop in other areas. We have mild winters and hot summers so, we plant carrots in October and let them grow all winter. Carrots seeds can be sown as soon as the soil can be worked, even several weeks before your average last frost date in the spring. For fall plantings, it’s recommended that carrots be sown 10-12 weeks before your average first frost date. 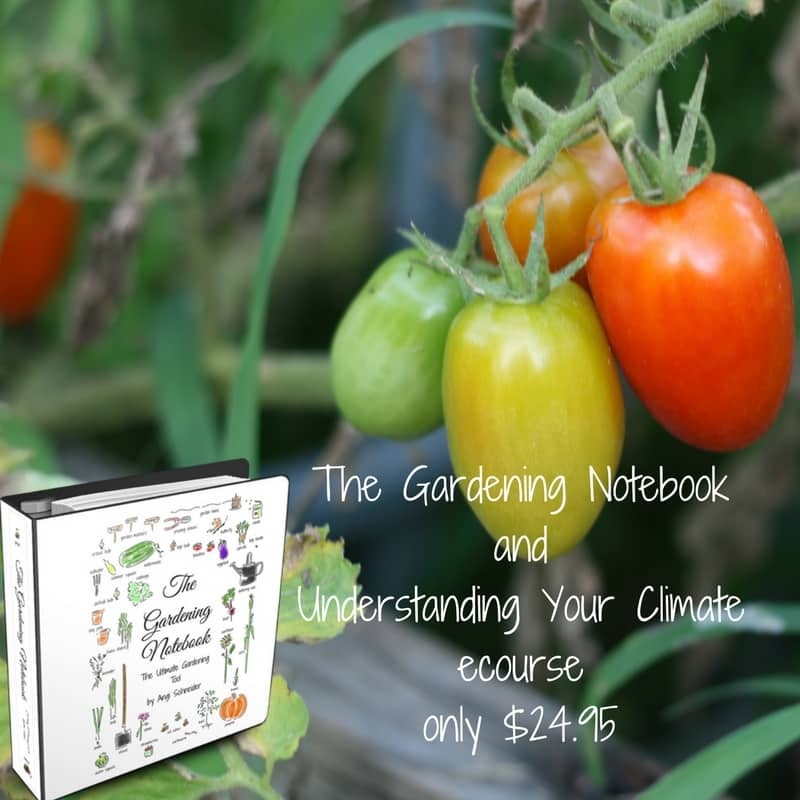 In my climate, it’s probably too hot to sow carrot seeds that early, so I think it’s best to use these suggestions as a starting point and try different things based on what you know about your climate. Proper soil preparation is key for carrots. Because of their long taproot, they love loose soil. If you have clay soil, like we do, consider using a raised bed for carrots. Or mix in a lot of compost into the clay soil before sowing seeds. We’ve grown carrots in clay soil before but they’re hard to harvest and will often break apart. Be sure that any rocks or sticks are out of the soil. 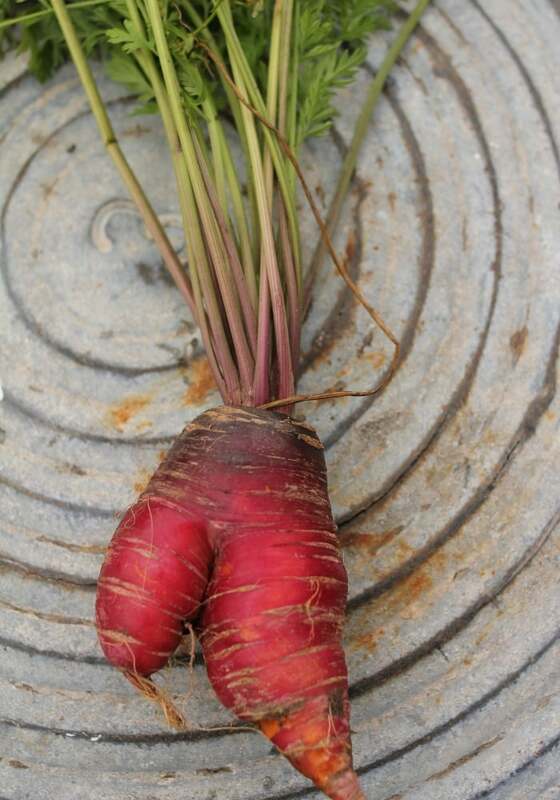 If a carrot hits something hard (clay soil, buried rock or stick) the root will split or become deformed. Carrot seeds are really small and it’s hard to sow them the recommended 1-2″ apart. Sometimes I make a diy seed tape to get the spacing right. And sometimes I just dig a trench in the soil about 1/4″ deep and sprinkle the seeds from the seed packet in the trench and cover them with soil. When the carrot tops are about 4″ I thin the plants to 2″ apart. Because the seeds are so small, they need the soil to stay moist in order to germinate. You can lightly water the soil once or twice a day but make sure that a crust doesn’t form on the top of the soil or the carrot won’t be able to push through. If you have a really low germination rate, try covering the carrot bed with burlap or a board for 5-7 days. When you peek under the burlap or board and see the green carrot tops, remove the cover. Because carrots are a “one and done” plant, I like to succession plant them so they aren’t all ready at the same time. I sow new seeds every 2-3 weeks from October through early February. Carrots will not transplant well, they’re roots will get mangled. So, don’t try to start them indoors. While this can be fun for the kids, I don’t recommend doing this intentionally. Trust me, you’ll get plenty of interesting looking carrots without trying to transplant them. Carrots grow their tap roots all the way down first then start filling out. 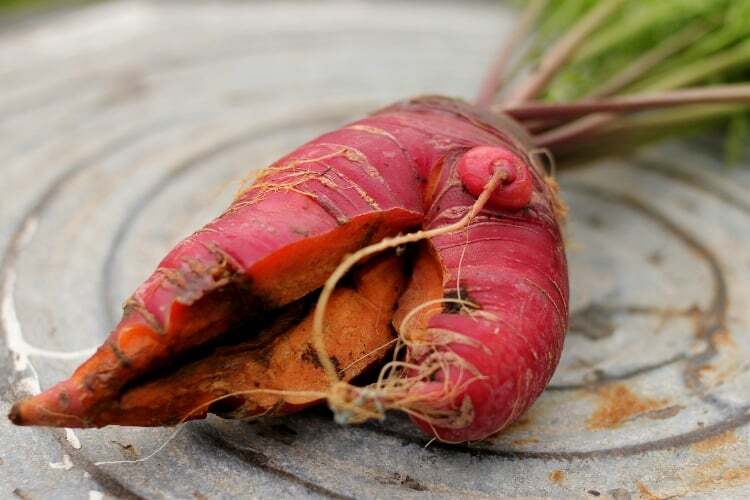 If you use too much fertilizer your carrots will be hairy (little roots growing off the carrot). These will not store very well. Like onions, carrots will are biennials and will bolt or go to seed in their second year. Unless, there is crazy weather which makes them think they are in year two, even if they are really only in year one. If the crowns of the carrot start to pop up from under the soil, just put a little dirt over them to keep them from turning green and bitter. Don’t plant carrots in the same bed season after season. Rotating crops helps prevent disease and improves your soil. Water the carrots regularly. They need about an inch of water every week. If you live in a really dry climate, you would water several times a week to keep them from drying out and then splitting. If you rotate your cops, build the soil with compost, and help the seeds germinate by keeping the soil moist, you shouldn’t have many problems growing carrots. If you have the carrot rust fly in your area, you can use floating row covers. Since carrots don’t need to be pollinated, this works very well, as long as you get the row covers on before the carrot rust fly lays eggs. If you don’t get it on early, then you run the risk of trapping the flies in with your carrots. You can also try growing onions nearby, they should help repell the larvae of the rust fly. Sometimes a gopher will eat just a part of a couple of carrots – solution: pay son 50 cents for every gopher he traps. Grubs or wire worms will sometimes chew on a few or tunnel through them. We feed these to the chickens. Over-watering will cause the carrots to split. Carrots like consistent water but don’t like to be flooded. 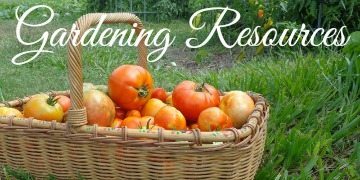 Companion planting is a way to add diversity to your garden beds and all let the plants actually help each other. Some plants help deter pest, other will break up soil, and some will enrich the soil. All of this is really great but don’t get too caught up doing trying to do it “perfectly”, just be aware and make intentional choices based on your climate and what your family likes to eat. And then make notes in your gardening notebook. Plant carrots with beans, Brassicas, chives, leeks, lettuce, onions, peas, peppers, pole beans, radishes, rosemary, sage, and tomatoes. If planting with tomatoes plant at least 15″ away. The carrots might be smaller but the flavor should be enhanced. Do not plant carrots with dill, parsnips, and potatoes. I’ve also read not to plant carrots with cilantro but I often do and have never had a problem. There are a lot more carrot varieties than what you can find in your local grocery store. Some are short and fat, some long and thin. Some are orange, of course, but there are also purple, yellow, and red carrots. Growing carrots in your own garden will let you try any exotic carrot you want. Short carrot varieties are good for container gardens or those who have clay soil. Parisian is a short carrot which look like orange beets. Another short carrot is Little Fingers which was developed in France for canning whole. These carrots only get 3″ long. Chantenay is a little longer but still considered a short carrot. It’s also a very sweet carrot. Long carrot varieties are what most of us think of when we think of carrots. Nantez is a popular variety that grows 6-7″ long, has a mild flavor, and is not tapered. Danvers carrots are 6-8″ long and are tapered. They are good for carrot variety for heavy soils, so if you are still working on getting your soil loose, try planting Danvers. If you have soil that’s loose to at least 12″ deep, you might want to try Imperator carrot variety. These carrots are slender and can grow up to 11″ long. There are many colored carrot varieties, too. You can get various shades of orange, yellow, white, red, and purple carrots. 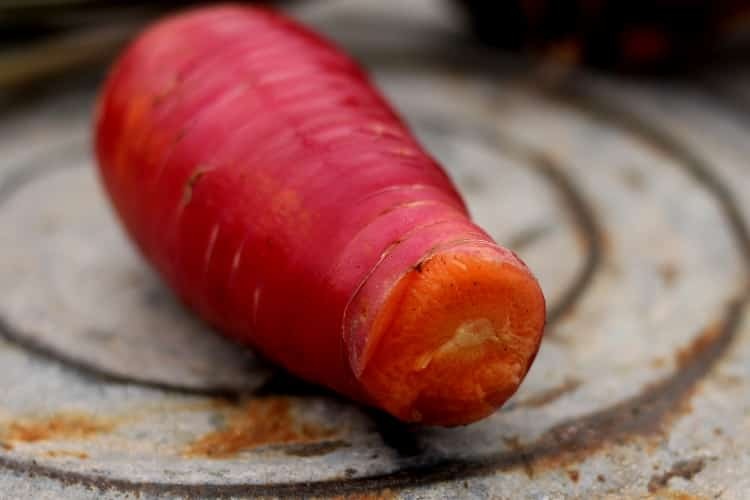 The red and purple carrots usually have an orange or yellow core and are just beautiful. If you’re looking to add more color to your diet, try different colored carrots. 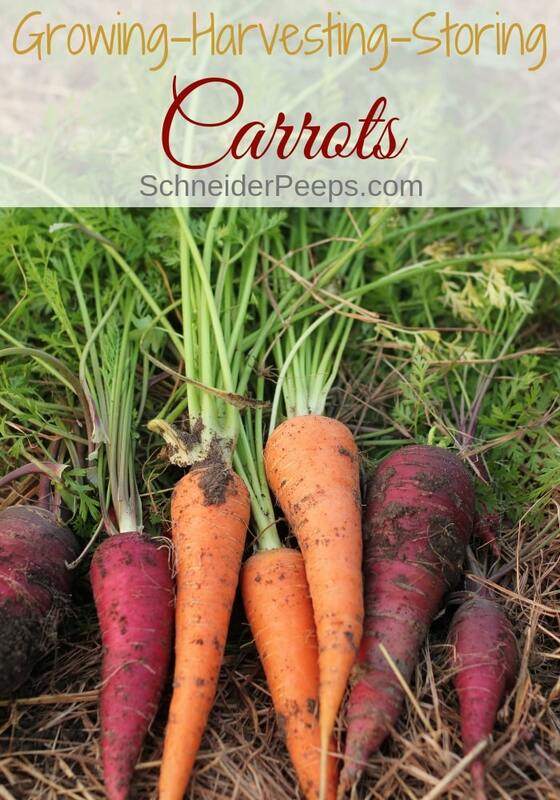 You can get Parisian, Chantenay, Nantez, Purple, and a Rainbow Mix carrot seeds from MiGardener Seeds. MiGardener Seeds sells their seeds for 99 cents a packet. 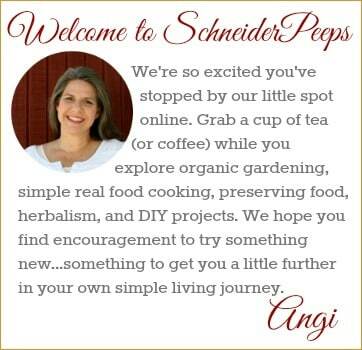 If you use this link, you’ll also get a 10% discount on your total order. Harvesting carrots is as easy as pulling them up out of the ground by the tops. If you have loose soil, they should be easy to harvest. If you don’t have loose soil, the tops may come off and leave the carrot root in the ground. If this happens just use a garden spade to dig the root out. Sometimes the carrot root will break. Even though we have raised beds, sometimes the carrot root grows into the native clay soil and the tip will get stuck and break off. 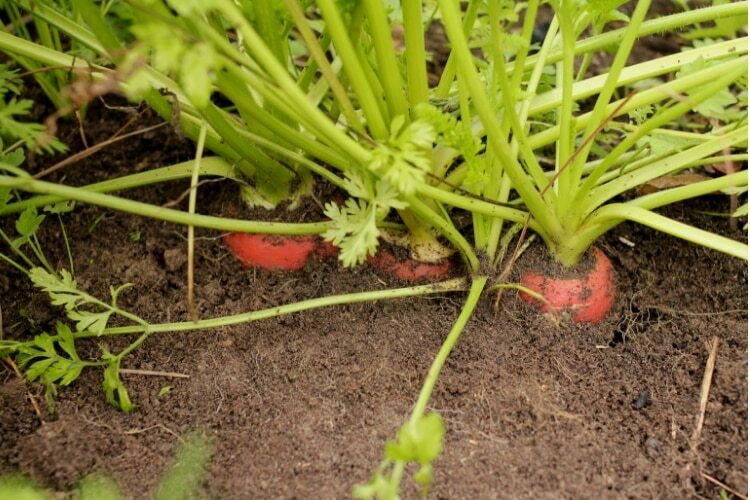 To check if carrots are ready to harvest, gently remove the soil from the base of the plant, exposing some of the root. If the top of the root is the size you want, then it’s probably ready to harvest. The size will vary depending on the carrot variety. Remember, carrots grow long first, then fill out. Carrot seed packets will also tell you days to maturity and you can use that a guide for when the carrots are ready to harvest. You can harvest carrots before they’re mature but their flavor won’t be as developed. We usually just harvest carrots as we need them. Then as the last bunch mature, we’ll harvest all of them and preserve them by canning or freezing. You can leave carrots in the ground as long as the ground doesn’t freeze. Just cover them with straw and they should be fine. I don’t live where it get super cold so I’m going off what I’ve read from people who do. If you live where the ground freezes, you’ll need to harvest the carrots and store or preserve them. To store carrots, cut the tops off leaving about 1/4″ of the greens on. Don’t toss the tops, there’s stuff you can do with them. You can store the carrots washed or unwashed. People tend to have strong opinions about this, I think you should try it both ways and see what’s best for you. If you have a cellar, you can store carrots for months. I’ve read that you can store them in damp peat moss or sand, this will keep them nice and crisp. If you don’t have a root cellar, you can preserve carrots by freezing, fermenting, dehydrating, or canning them. I like to grate and freeze carrots to use in baking. To can plain carrot s you need to use a pressure canner not a water bath canner. However, you can pickle carrots and use a water bath canner. Dehydrated carrots make a fun snack, especially if you season them. Or you can dehydrate them plain and rehydrate them to use in soups and other cooking. We preserve carrots by fermenting by pouring a saltwater brine over them, similar to how we ferment peppers but I usually add dill to them. Of course, carrots can be eaten raw and they’re great! But they can also be chopped and sauteed with other vegetables, and added to soups and pastas. They can be grated and added to rice or greens, or be used for a cake. Most people just eat the root but the greens are also edible. They can be used to make a pesto, tossed in with chicken bones to make broth, or added to salads. Some people find carrot tops somewhat bitter but they can be blanched to get rid of the bitter taste. I like to dehydrate carrot tops and add them to our green powder mix. I use this mix to add nutrition to smoothies, rice, eggs, and whatever else I can get away with sprinkling it in. Feel free to add any other carrot information in the comments.You can find information about other fruits and veggies by searching clicking on the In The Garden tab up top or in The Gardening Notebook. Yum! We love carrot top pesto too. I hope you have a great gardening year!